The Judge opens with a shot of a stack of books and a pair of glasses and then cuts to an old baseball glove and a home movie camera. Clearly, the present day will soon come to terms with the dark burdens of the past: this earnest theme will play itself out in a dozen ways in director David Dobkin’s father/son courtroom melodrama. Robert Downey Jr., who produced the film with his wife Susan, is Hank Palmer, a slick, rich but clever and capable city lawyer. When his mother passes away he is called back to his hometown in Indiana where his father, Joseph, is a circuit court judge. Unlike Hank, Joseph is a man of stern integrity, dolling out moral lessons to the citizens around Carlinville, Indiana, a little town that time forgot. He and Hank are oil and water. Following a tense funeral Hank abruptly leaves to catch a plane home, but is stopped on the plane by a phone call from his brother. Their father Joseph has been arrested in a hit-and-run accident. Returning to deal with the situation, Hank finds that the revelations won’t stop coming. Evidence begins to accumulate explaining to why father and son are so at odds, and then other long-held secrets are unearthed. The film doesn’t miss a soap opera trick. The slow-witted younger sibling, Dale Palmer, is nicely underplayed by Jeremy Strong. Vincent D’Onofrio plays the wounded older brother Glen in full Law & Order: Criminal Intent mode: bearish, twitchy, calm, and knowing. He’s a great actor. But everything that happens in The Judge is part of a schematic design that never lets up its well-intenioned grip. Vera Fermiga, who is always a pleasure on screen, is perfect as the former girlfriend hiding still bigger secrets. These are wonderful actors to watch. But along with the unrelenting father-son dilemma there arises new family squabbles, a cute and loving father/daughter relationship, and a divorce side plot, the latter going absolutely nowhere. And did I mention such additional complications as dementia, death, cancer, law, murder, and revenge? Characters are introduced only to vanish; in one case (I’ll avoid a spoiler here) there is a major disclosure that could make for another movie. That plot twist is dropped in favor of some final Hallmark Card moments of cloying bathos. The good parts of The Judge make the missteps more painful. It’s great to see that Downey is not just a franchise. His Hollywood smirk is wiped off his face and he does some real acting. Robert Duvall can still chomp down on a part. Though I can’t imagine why Judge Palmer’s age is given as 72 when Duvall is actually 83, and looks it. 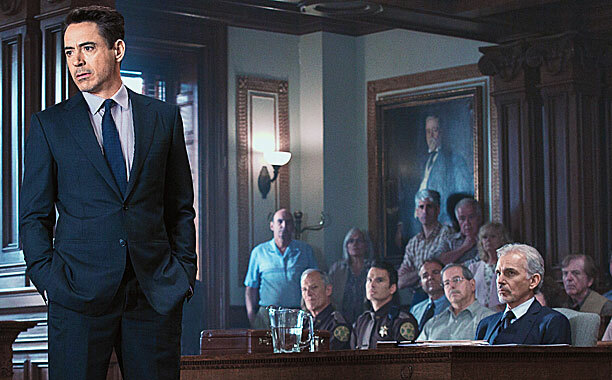 Billy Bob Thornton as the prosecutor make the right professional impression and sounds great. He approaches his role with unrelenting seriousness. Boston’s own Lonnie Farmer, in a cameo role as Gus the Bailiff, is one of the anchors for the courtroom drama. Because we’re Bostonians, I will take the liberty of saying that the plot ultimately hinges on Gus the Bailiff. Much of the film was shot in Massachusetts, and that makes it a joy for locals to watch. The town of Shelburne Falls looks terrific; the community fell in love with Downey. The film is beautifully shot by Janusz Kaminsk, though its over scored by Thomas Newman. Much of the dialogue is clever and a lot of fun. Downey and Duvall go at it in high fashion; it’s a feast of acting. I just wish the portions of melodrama were considerably smaller.